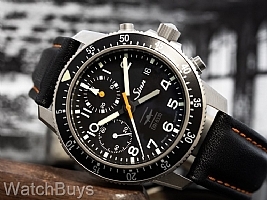 Verified Owner Comments: I’m enjoying my new Sinn 103 a great deal. The look and feel are exactly what I was looking for. I compared some other manufacturers and did not feel they shared the combination of lightweight yet solid feel of this one. All of the features and functionality billed by Sinn for this watch I feel are spot on. I don’t care for the leather strap, but that’s more of a preference I think as opposed to comfort. "Strong history shows in great watch"
Verified Owner Comments: Was leaning towards a Rolex GMT when I came across an review of the Sinn TESTAF technology and the new DIN 8330 watches. Did my research and purchased the 103 TI UTC IFR. WatchBuys was easy to deal with and item arrived as promised. I swapped the strap for a NATO strap and love the watch. The chunky size and useful features like ease of readability and no-glare crystal belie Sinn's history combined with the new technology and titanium case make for the perfect travel watch. I can wear it all day and night and forget I am wearing it. Highly recommend.